Welcome to Tom “Doc Tom” Wolosz’s Website. Like this in Facebook and Share with friends. Read the first 3 chapters of The Agony of the Gods and enter the universe of The Machine! I interview R.F. Bruce, author of The Life and Times of Dinah Marton. And coming soon – I interview R.F. Bruce. What makes you write about a multiple murderer? I interview Curtis Bausse, author of the Magali Rousseau mysteries and editor of the Book A Break Anthology series. Definitely a fun interview, especially for mystery fans. I review Perfume Island a new Magali Rousseau mystery by Curtis Bausse, a great whodoneit! Read my review. I review With Our Eyes Open a collection of short stories edited by Curtis Bausse. Life’s a journey and each of these stories is a step along the way. Read my review. I review Curtis Bausse’s crime procedural, One Green Bottle, a fun read that pits a recent divorcee against a serial killer! Read my review. and my interviews with Kate, Atthys, and Mike. her great book “Prostitute of State”! Amazon and get yourself a copy! If you’ve read my review of Spark by Atthys Gage, you can now enjoy my interview with Atthys. I had a great conversation with him about his writing, Spark, and a number of other neat ideas he has and books he’s published. And don’t forget to read my reviews of Prostitute of State by Kate Kinnear, and Demiurge, Blood of the Innocent by Michael Hagan. And, of course, there’s my interviews with Kate and Mike! Read my review of Spark by Atthys Gage. A neat YA novel about a young woman and a…ah…Spark! A book you’ll enjoy. I interview Kate Kinnear, author of Prostitute of State, a great ‘coming home/espionage’ novel that’s a free read! Read my interview with Kate. Read my review of Prostitute of State. And remember to check out my review of Demiurge, Blood of the Innocent. And my interview with the author: Mike Hagan. I review a great ‘coming home/espionage’ novel that’s a free read! Prostitute of State by Kate Kinnear is highly enjoyable and free. See my review here! I’m adding another feature today – Author Interviews. I want to spotlight new authors whose books I found really interesting. To make these different from the standard Internet interview I’m going to conduct them by e-mail, one question at a time (of course, you’ll just get to see the finished product). Hopefully, this will make them more spontaneous and give you some insight into these authors. I’m going to start out with an easy one (for me). So click here for an interview with a great author and all around good guy – Mike Hagan, author of Demiurge, Blood of the Innocent. And remember to check out my review of Demiurge, Blood of the Innocent. Hello All. Decided to start a new feature – book reviews! I’m looking for books by new authors. When I find good reads I’ll post a review to tell the reading world what they’re missing. I’m going to kick off DocTom’s Book Reviews with a review of a book that deserves much more attention than it’s gotten – Demiurge, Blood of the Innocent by Michael R. Hagan. Just click on the title to see my review. Time to think about your characters. The writing may be okay, but the story gets rejected. Here’s one more reason. Ever wonder why so many stories get rejected? Here’s one reason. What if Shakespeare had been a college professor? Bending your world’s rules hurts your story. Breaking them can kill it! Post 17. World Building – Consistent Rules Rule! When building your world you need to have rules – and follow them! A new photo post – Adirondack Nights. If you like the Adirondacks by day, you’ll love them by moonlight. Views from Cascade and Indian Falls taken by the light of the full moon. Post 16. Feedback on Your Work – Part 2. Receiving on Musings, Jottings and Stray Thoughts page! Getting feedback can hurt, but how to take it is among the most important things a writer must learn. Post 15. Feedback on Your Work – Part 1. Giving on Musings, Jottings and Stray Thoughts page! Before you get feedback, learn to give feedback! Post 14. The First Draft Thing – Part 2. on Musings, Jottings and Stray Thoughts page! Things you should do with that first draft. Post 13. The First Draft Thing on Musings, Jottings and Stray Thoughts page! Important things not to do when you finish that first draft. Read my novella: And The Last Shall Be First (Careful what you wish for – you might get it). Just a reminder – great interviews with writers including Mike Hagan, Andy Weir, Ben Kane, and more on Book Nook Diva. Also, coming soon, an interview with Michelle Hiscox, author of the paranormal fantasy A New Day at Midnight. And of course, I’m there too! Post 12. What’s it like Writing a Novel? Part 4. Characters and World Building, on Musings, Jottings and Stray Thoughts page! Above the Clouds. Pix from a day on Mt. Marcy. See Doc Tom’s Vanity Page. or go right to post Above the Clouds. Post 11. What’s it like Writing a Novel? Part 3. Originality – creating a scene or a world, on Musings, Jottings and Stray Thoughts page! I’m interviewed by the Book Nook Diva on her Facebook page! 10 blog posts on Musings, Jottings and Stray Thoughts page! Adirondack Mountain pix on my Vanity Page! Coming soon! I’m interviewed by the Book Diva on her Facebook page! And for the long standing stuff just read on! 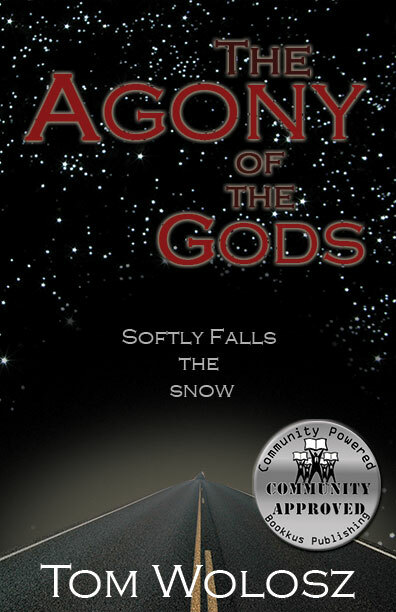 My first book, Agony of the Gods, Softly Falls the Snow was published January 1st by Bookkus Publishing where the readers choose the books that get published. For more information, or to order, visit The Bookkus Shop, or Amazon, or Barnes and Noble. I’ve also added a blog page where I’ll just post anything I want called Musings, Jottings and Stray Thoughts, currently featuring (among other things) an excerpt from the worst Sword and Sorcery Fantasy ever written, musings on what it’s like to write a novel, and advice on which web sites to use for writing and when to use them. If you’ve already read Agony of the Gods or Staircase and have questions, I’ll be happy to answer them. Just post them on the Into The Machine Page. If you have other questions, insights or just random thoughts, feel free to post them for discussion Around The Campfire. Once you’ve read Agony of the Gods, Softly Falls the Snow, stop by the Agony of the Gods – Reviews page and post your thoughts. Would you like to see a sequel? I’m also into photography, so take a peek at Doc Tom’s Vanity Page for some neat Adirondack photos. And for more great books stop by the BOOKKUS authors page for information about other great books from BOOKKUS Publishing where the readers choose what gets published. I hope you enjoy the site, and Thanks for stopping by!